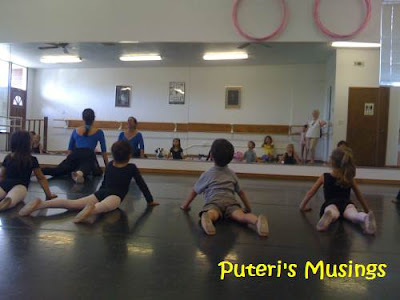 Last week, Denice was invited to join her classmate to her dance class during their Bring a Friend Week. Denice was very excited about the event and looked forward to it. 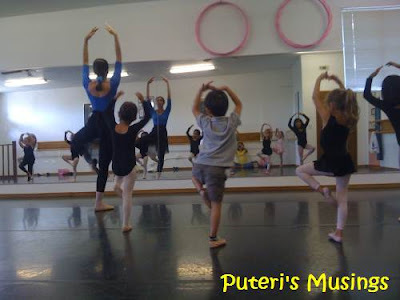 Unfortunately when we arrived at the dance studio she had an anxiety attack, cried and refused to even enter the studio. She already had her tap dancing shoes on but it was like making her take a shot at the doctor's office! 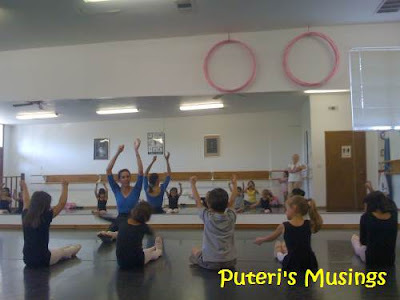 Anyway the dance teacher let us in the studio and we sat in a corner and watched the kids go through their exercises. I encouraged Duncan to join the girls just to encourage Denice. He had a lot of fun! I found a pair of ballet shoes for Duncan and he put them on. He didn't care they were pink! Towards the last 20 minutes of the class, Denice relaxed a bit and started imitating the moves from her corner. She still refused to join them on the floor though. Can you see Denice in the mirror imitating the dance move? I was busy taking photographs and did not notice that she had started following some of the dance moves. But at the last 10 minutes of the class, she joined the other kids for the story telling session and also followed some of the moves. 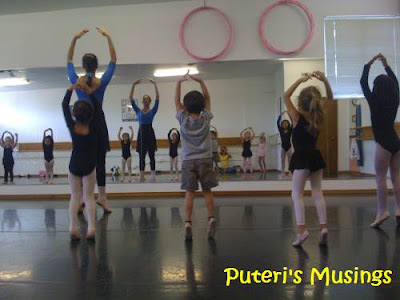 In the car, on our way home, she said she wanted to go to another of the dance class. Too late Denice, you had your chance and you blew it! Actually, we are planning on sending her to a dance class. The fall classes are now open for new students. They also have jazzercise for adults at that dance studio. I might sign up for that too. I think Denise need encouragement..Duncan is very sporty!!lol! I am sure, next time round, Denise will join in the dance...just need time to adjust. Aiyoo...Duncan is so cute following all the moves. The mum should be in the class too the only Denice will be comfortable to join in. Don't worry she will be comfortable the next time you take her to the class. Did you find any use for the kain batik lepas? Please convey my regards to Douglas.